Have you ever had one of your photos used without your permission? That’s why you should always include your name and a copyright notice somewhere on every photo. Since Aperture doesn’t provide a way to do that easily, I wrote Watermark. 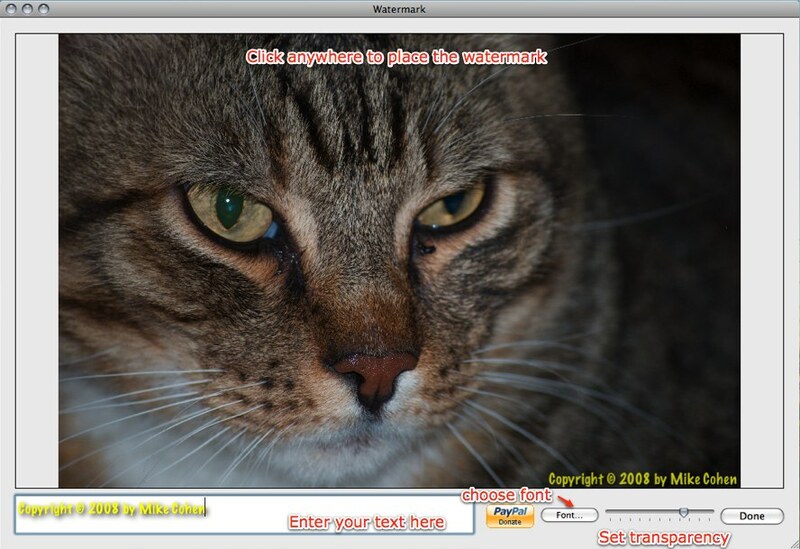 Watermark is an editing plugin that works with Aperture 2.1 or later. To install it, first quit Aperture if it’s already running. Go to the Library folder in your home directory, find the Application Support folder, and look for the Aperture folder. If the Aperture folder doesn’t contain a subfolder called Plug-Ins, create that folder. Finally, drag the Watermark.ApertureEdit icon to the Plug-Ins folder. 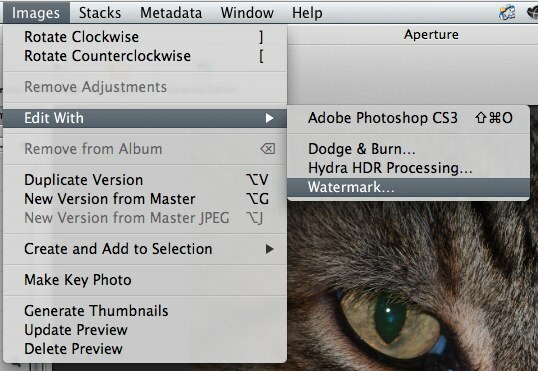 The next time you open Aperture, a new item called Watermark will appear in the Edit With… submenu of the Images menu. To use Watermark, select a photo and choose Watermark from the menu. It will create a duplicate copy of your photo and then open the Watermark window. Enter your copyright or other message in the text box. Click on the Font button to bring up a standard Font panel, which will let you change the font size, style, and color. You can adjust the transparency of your text using the slider. Finally, click anywhere in the image to place the text. When you click the Done button, your changes will be saved to the new copy of your photo. If you want to cancel the changes, close the window by using the close box. If Watermark duplicated the photo, it will delete the copy when you cancel. The next time you open Watermark, it will remember your text, style, transparency, and where to place the text. Watermark was written by Mike Cohen. Although Watermark is free, if you find it useful, please contribute using the PayPal donate button to encourage its continued development. Nice to have this application created. Thanks. However, I’ve noted that once embed the watermark, the photo quality degrade or simply edited settings of the photo become noisy. Hope you can figure out the problem and let the original settings remain as it was before embed the watermark. I think your watermark tool is awesome! I downloaded it and it worked great, until I made a mistake: I accidentally deleted the text in the text box and now nothing shows up on my pictures. I deleted the file over and over and downloaded a new version many times into my Library, but now when I choose "Watermark" nothing shows up. Is there a way to edit your text (or lack of it)? I understand that the program remembers the text, etc. once you use it, but is there a way to go back and edit? Open your ~/Library/Preferences folder and remove the file com.mcdevzone.watermark.plist which stores its settings.